When you are rock climbing, it is vital that you have the right accessories. Appropriate gear enhances your safety and also helps you withstand the pressures that come with the challenge. You should prioritize the type of equipment and clothing you have as you prepare for your climbing adventure. Since your hands are the most significant contact point between you and the rock, it is important that you pick the right gloves. Comfort and dexterity should be the biggest factors to consider when choosing rock climbing gloves. You also want a rock climbing glove that fits properly while protecting your hands from the rough rock edges. In addition to comfort, your rock climbing environment will also determine the kind of glove to choose. Cold environments will require gloves that are warmer compared to hot or warm environments. Other features that are likely to influence your decision include durability, thumb crotch, and the ability to be used for several purposes. Here are our top five picks for best rock climbing gloves. The reputation of the Black Diamond Crag precedes it. This rock glove is made by Black Diamond, a leading brand in the world of climbing. The company manufactures well-made gear that is affordable and designed specifically for climbing enthusiasts. These gloves come in various sizes differing from extra small to extra-large. Overall, they have a comfortable fit with little shifting which is crucial while you are on the mountain. The hook and loop closures allow for a solid fit. They feature synthetic leather and breathable stretch mesh as there build material that allows for great general flexibility and strength. They also have an added reinforcement to the index finger and thumb crotch, making it perfect for handling ropes or belay lines. The tough material backing on this glove makes it a durable piece that will serve you for a long time. 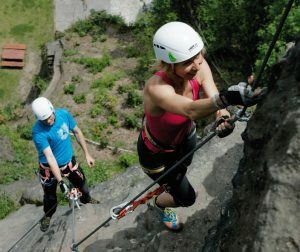 Generally, the Black Diamond Crag provides enough flexibility for climbing and belaying circumstances. You will find these great for struggling around rocky slopes and bouldering too. They, however, are not the best gloves for use in situations where fingertip sensitivity is vital such as crack climbing. These are some of the most comfortable gloves nonetheless. They have a good feel to it due to its breathability while protecting your hands through the tough synthetic leather. These gloves might not provide the best fingertip sensitivity or dexterity, but they excel in protection, overall fit, and strong build. We recommend these gloves as an added accessory to your rock climbing gear. 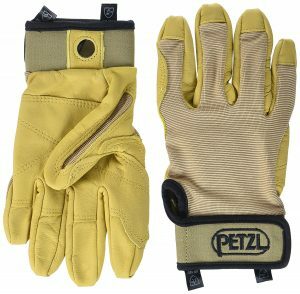 The Petzl Cordex Lightweight gloves offer a tremendous balance between protection, longevity, and flexibility. They come in different sizes ranging from small to extra-large thus finding a fitting pair should not be too daunting. They tend to run a little large about a third of the time, so you might consider sizing down for an ideal fit. The extra leather at the fingertips may present a dexterity hindrance for some climbers, but that will solely depend on your preferences. The Petzl Cordex Lightweight has an average manual dexterity that is okay for basic rock climbing and belaying. They are sturdily designed to maximize on the range of motion of the digits while still providing a great amount of protection. 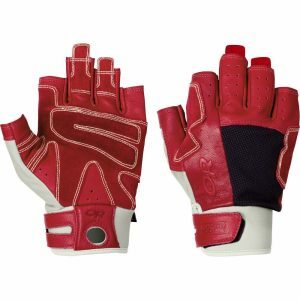 The gloves are made of a combination of long-lasting goatskin leather and breathable nylon material. The combination of these two materials makes for increased durability and breathability. There is a clever addition to the critical areas such as the thumb crotch, index finger, and fingertips. These have a double coating of leather for additional protection and longevity. The Petzl Cordex may be a little heavy for crack climbing. Despite this shortcoming, the Petzl Cordex still ranks high on comfortability for repelling and belaying purposes. These gloves may be a bit large. The Petzl Cordex Lightweight has a somewhat restricted manual dexterity when it comes to belaying and grabbing to rock facets. The Petzl Cordex Lightweight glove is a great choice for any climber. If you are looking for a glove designed to protect your hands when climbing then the Outdoor Research Seamseeker is a great choice. These gloves provide additional flexibility and dexterity that is required at high attitudes. 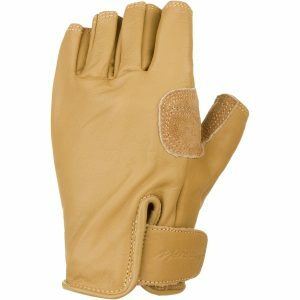 The Seamseeker features a sturdy build comprising of polyester and spandex at the back of the hand, a goat leather front, and a neoprene cuff. They offer just sufficient stretch overall to allow for unrestricted movement and protection of the hands. 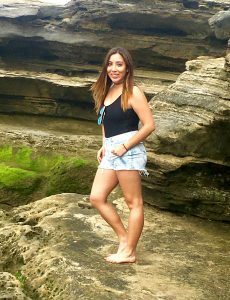 They come in various sizes ranging from small to extra-large thus finding a pair that fits you right should not be a big deal. It amazingly ranks well on how it fits the size customers expect without showing any evidence of shrinkage or excessive stretching over time. These gloves are quite pliable given the extra padding and materials incorporated for protection. Your fingers will enjoy a wide range of unrestricted motion thus gripping that crack or rock face should be easy to do. While the additional gel wadding at the palm may be a bit much for some users, the gloves are very cozy overall. It features ample space for movement in the upper palm, fingers, and a conveniently snug fit all over the lower palm and the back of the hand. The materials used to make this glove make them a durable option for both expert and amateur rock climbers. These rock-climbing gloves might not be the best fashionable gloves, but when it comes to climbing, they are unbeatable. Their ability to combine exceptional flexibility and protection in a way that is comfortable on the hands makes this glove a valuable accessory. What’s more, they also have a great price. These leather gloves made by Black Diamond provide great manual dexterity and sufficient durability generally at an awesome price. Their sizes range from extra-small to extra-large so even if your hands are slightly different from average, you will be able to sport a pair. Most buyers find them true to size, but you can also consider to size up or down if it does not fit right. Black Diamond has produced yet another astounding piece of artistry in this glove. 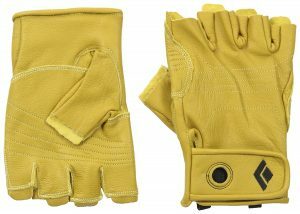 Its classic design allows for full range of finger motion while still offering the great protection usually present in the company’s gear. The Black Diamond Stone gloves are made from quality goat leather together with a strengthened leather palm for increased toughness. They also have Kevlar stitching and a hook and loop cuff closures for a stable fit. This piece is a great pick for those rock climbers that are more comfortable in gloves that have the slightest amount of material and stuffing. While some may enjoy a little more padding in the palm area, mostly, these gloves are light and easy to sport. These gloves are not as long lasting as the others on this list are, but generally, they are effective in basic climbing use. The Stone Climbing Gloves are a great versatile choice for rock climbing when dexterity and comfort are a priority. Despite less durability overall, these gloves should serve you for quite a couple years of climbing. The Metolius Climbing gloves have a three-quarter length finger hole design. This construction offers warmth while also protecting the bottom half of your fingers from cuts and abrasions. They come in a wide array of sizes; hence, it will be pretty easy to find the size that fits you right. They are well cut at just the perfect length and strengthened in all the right places allowing your hand to breathe. They also have a sturdy clip-in loop; therefore, you can easily fasten them to the side of your belt or strap. Its fit around the fingers is comfortable, a rare thing to find in leather gloves. It also has an incredible dexterity to create the utmost climbing glove. The ends of the fingers are cleanly reinforced with firm triple stitching that prevents them from blowing open too quickly. 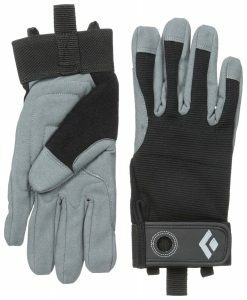 The palm on these gloves is more reinforced than most other fingerless gloves. The Metolius Climbing Gloves feature a leather construction making it durable thus a great pick that will serve you for seasons to come. Its strong make also allows for gripping of rough rock surfaces and belaying. These gloves work great for rock climbing and gripping ropes without getting that rope burn. This great pick will not disappoint you. Rock climbing gloves are majorly made with either leather or synthetic material. It is vital to understand what each material is fit for in order to get the perfect glove fit for your everyday use. Leather gloves are usually more durable, very comfortable, and occasionally cheaper than synthetics. Leather is typically better than synthetic because of its natural feel and it’s also more dexterous and flexible. The principal hindrance for leather climbing gloves is water protection. Leather is goof for dry to moderately wet conditions but anything more will require regular treatment in order to stay dry. Synthetic gloves though not as durable as leather, are great for waterproofing and breathability. Many rock-climbing gloves usually combine both leather and synthetic leather on the palm and fingers to get the best of both worlds. Dexterity of a glove is paramount feature when finding your way up a mountain or a rock surface. 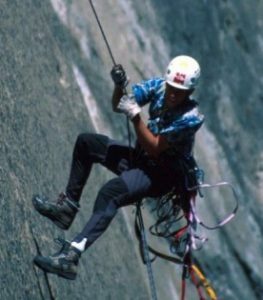 You need to comfortably latch on a rock edge as you hook your climbing rope thus the flexibility of the glove should be considered. If you are an expert mountain climber, you’ll need more dexterous rock climbing gloves such as the Black Diamond Stone. The rock-climbing glove you choose should be able to keep your hands aerated in a way that prevents sweat accumulation. The last thing you need when rock climbing is itching in your hands due to excessive sweat accumulation. If you do rock-climbing in humid, wet areas, you should consider the gloves’ waterproofing vis-a-vis breathability. Waterproof options such as the Black Diamond Stone would be a great pick. Whether you are an amateur rock climber who climbs for leisure or an expert mountain climber, the listed gloves will be excellent choices for your escapades. Waterproofing capabilities should also be an important consideration if you do climbing in wet regions, as excess moisture in your palms can be annoying. It is also vital to try on the glove before purchase to ensure it fits you right and comfortably and has the right level of warmth that you want. Sport one of these rock-climbing gloves next time you head out to climb with friends and create memorable experiences while you’re at it.